The Old Bakery Guest AccommodationSet in the beautiful Waveney Valley, a small but perfectly formed, quintessentially Norfolk village, Pulham Market has a traditional Village Green surrounded by charming thatched cottages, the village pub and shop and the wider stunning rural countryside scenery. The Old Bakery is a delightful grade II listed building dating from 1580, with a timber frame, exposed internal beams and bags of character. We have five spacious and comfortable bedrooms all with en-suite facilities. The Oak, Harvest and Barley Rooms have exposed beams and face the front of the property catching the evening sun. The Granary and Mill rooms have luxurious contemporary decor and face the rear of the property with stunning views over the Waveney Valley countryside. Cooked to order, our sumptuous full English breakfasts feature Norfolk bacon, sausages and free-range eggs and bread from our local bakery. 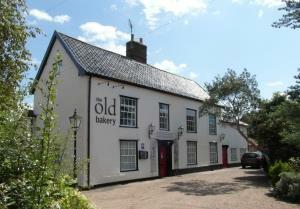 A charming 16th century oak-beamed former bakery set in a friendly, quintessential Norfolk village offering quality accommodation in spacious en-suite rooms with delicious breakfasts. Village pub serving great food two minutes walk away. Pulham Market is 2 minutes drive from A140, signed 'The Pulhams'. Once you have turned off A140 follow road for about 1 mile into Pulham Market. As you round a sharp right hand bend you will find our gravel driveway just AFTER the hairdressers. There is private parking directly in front of house. The nearest station is Diss on main line to London where trains make regular stops. 15 minutes taxi ride. The Old Bakery has a wonderful feel the minute you are welcomed through the door. The whole atmosphere is peaceful and relaxing. Rooms large and well equipped. Breakfast delicious and leisurely. Location perfect for exploring a wide area of Norfolk. solid pathway to front door from gravel drive. One ground floor bedroom availale meeting National Accessible Scheme M1 standards. The room is very spacious and ideal for those who find stairs difficult. The room has twin beds with en-suite shower room. There are two small threshold steps at the front door.